7.07 points at 15 votes (rank 331). 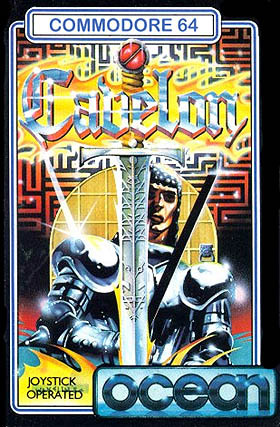 The game Cavelon is a conversion of the machine with the same name. The graphics correspond to the topic and the knight figures look similiar to the ones in dungeon games (Telengard, Dunzlin, etc.). Music and sound effects are plenty in the game. 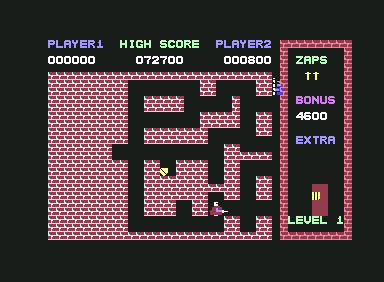 The aim of the game is to collect all 7 parts of the gate (no matter in what order) in each of the 6 labyrinth-like levels that scroll to the left and the right, to get to the next level. 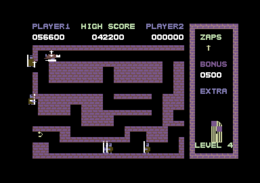 After the sixth level (which is guarded by the wizard) follows the end sequence and after that you start again with level 1. You start with 3 lives and 2 Excalibur (Zaps). Hostile knights need to be hit 1x, archers 2x. Items that are no door parts get you points when they are collected. The version by "Hokuto Force" contains next to different cheats (unlimited lives, invulnerable, unlimited Excalibur) also the manual. 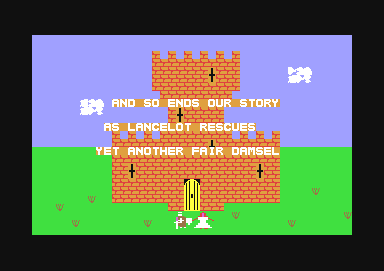 Rombachs C64-Spieleführer: "With the dungeon games has Cavelon only the saga background in common, action fans get their money's worth, has you really have to work hard to get on. A very good dungeon action. Vote: 2." Robotron2084: "A wonderful trashy labyrinth game from Oceans days as a child. If one wants to give himself a full load of retro, he should turn the volume to the maximum in this game. You really must have heard that...ugh! 5.5 out of 10 points!" Cavelon in the Killer List Of Videogames.